The weather could not have been more perfect as the mid-afternoon Team Building event got underway. There were 8 teams, all donning Prosource IT T-shirts with captains standing out loud and proud in the Team Challenge Company coloured It's a Knockout strips. The teams prepared to do battle across a vast array of high-energy team activities and crazy races and games in a bid to take home the much coveted TCC award. Who would walk away champions...? Would it be CBA or Club Tropicana? Perhaps the A-Team or Angie's Angels could do it? All would be revealed in just a few short hours. The hilarity over at the Knockout Arena lasted throughout the whole afternoon, it really was tremendous fun...and wet! 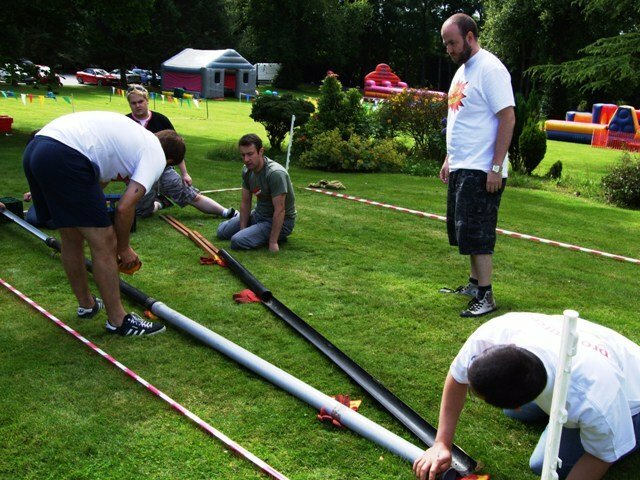 The races kicked off with the traditional warm-up, before blasting into our huge number of wild and wacky races - from Caterpillar Run to Chariot Race, from Obstacle Skis to the Grand Finale, the mighty Sponge Fling! 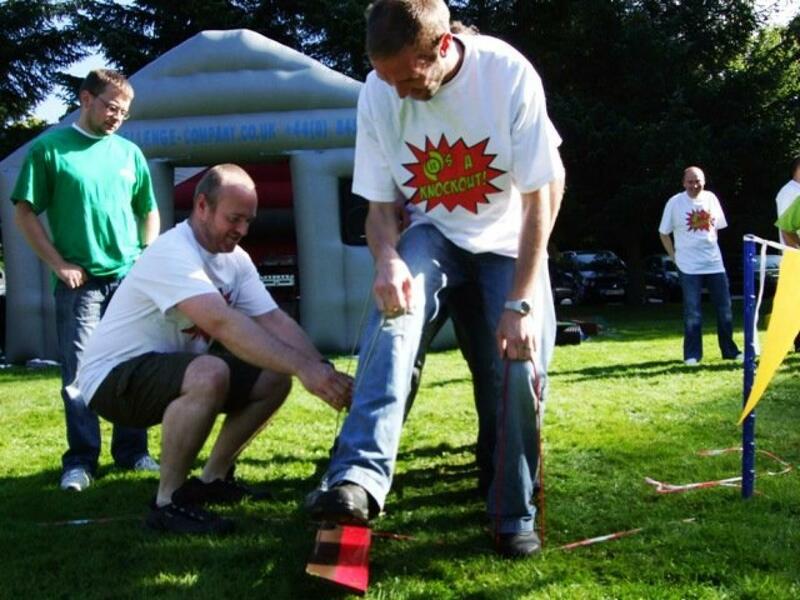 My highlight of the It's a Knockout zone had to be the fantastic non-golf performances and the shouts of Fore as the balls went slightly adrift ! Other highlights include more than a few pairs of wet pants following the Chariot Race, and the huge cheers that rang out as the cheaters got drenched - most of them from Team 1st Place! And so, with all the games and Team Building challenges completed and the scores checked and verified, the time had come to announce the Winners, but first of all, the Last Place Finishers...! It was pretty tight, but stepping up to collect the Wooden Spoon, to huge cheers and laughter, the Magnificent 7 Team! The rest of the scores were announced until there was only two, the appropriately named Winners Team and Team 4Thought. Unfortunately, there could be only one champion team, and on this occasion the Winners Team were just pipped at the post, by only 300 points! And so, the almighty Team 4Thought stepped up to rounds of rapturous applause as the Winners Trophy was lifted high into the air! 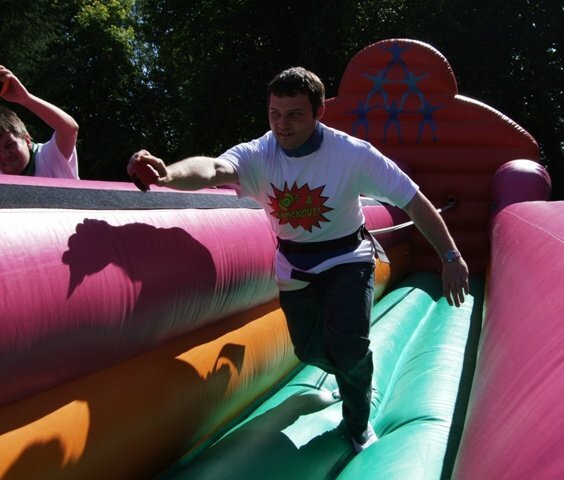 The entire event had been fantastic, and all the It's a Knockout entertainment had been thoroughly enjoyed by all in attendance. A big thank-you must go to Amanda, whose hard work and dedication really ensured that the event was a hugely successful and memorable one. The group from Prosource IT were great fun and a real pleasure to work with, and we at Team Challenge Company certainly look forward to seeing everyone again some time in the near future.